Restaurant Owner today released the results of their 2017 Independent Restaurant Recruiting Survey. The report summarizes input gathered from over 400 independent restaurant owners and operators regarding their proven recruiting practices. RestaurantOwner (RestaurantOwner.com) today released the results of their 2017 Independent Restaurant Recruiting Survey. The report summarizes input gathered from over 400 independent restaurant owners and operators regarding their proven recruiting practices. The days of the Help Wanted sign are numbered. Only a third (34%) of independent restaurant owners reported using signs placed in their restaurant to announce job openings. Instead, resourceful restauranteurs are turning to technology in their search for new talent, with 57% indicating that they use internet classifieds, 56% social networks, and 44% internet job sites in their search for new talent. Despite technology-based solutions, word-of-mouth is still the best recruiting tool. 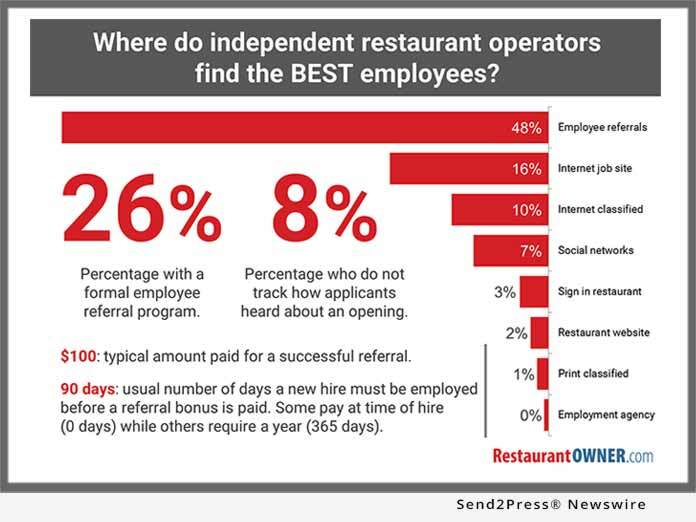 An overwhelming majority (86%) of independent restaurant operators rely on employee referrals to find new team members. And when asked where they found the best employees, 48% responded with employee referrals. Surprisingly, only 26% of respondents had a formal referral program. For independent restaurants that rewarded successful candidate referrals, employees typically earned $100 per referral once a referred candidate was employed for 90 days. A positive restaurant culture (48%) was the most cited response to, "What's the #1 reason people want to work in your restaurant?" Culture was more important than a desirable schedule (8%), the need for a job (10%), and even good pay/benefits (22%). Despite this, only 39% of respondents included information about their restaurant culture in job postings. The two most cited hurdles currently faced by independent restaurant operators are a lack of qualified applicants (78%) and competition for employees (44%). Savvy restaurateurs shared that they overcame these hurdles with continuous recruiting, employee referrals, and by actively recruiting the employed. Additional insights, graphs, figures, and statistics are included in the report. With over 46,000 members since 1998, RestaurantOwner.com's mission is to change lives by educating and inspiring independent restaurant owner operators to create restaurant success stories. It's committed to providing practical, proven insights, and resources to enable members to build a better restaurant, a better business, and most importantly, a better life. *Image Caption: A selected metric from the RestaurantOwner 2017 Recruiting Survey Report.